DIE Martis, 15 die Octobris. Bill to suppress Atheism, Swearing, &c.
Message from H. C. with the following Address. Address of Thanks to the King for dismissing the E. of Clarendon, disbanding the Forces, vacating the Canary Patent, &c.
Message to H. C. about presenting it. Message to the King about it. Houses to attend the King with the Address. Message to H. C. about it. Epus. Lyncolne. Sir Orlando Bridgman, Mil. et Bar. Ds. Custos Magni Sigilli. Vicecomes Mordant. Ds. Berkeley de Berk. Hodie 1a vice lecta est Billa, "An Act for settling Part of the Estate of John late Earl of Clare, and for enabling Gilbert Earl of Clare, his Son and Heir, to dispose of some other Part thereof, for Payment of Debts and Portions." Hodie 2a vice lecta est Billa, "An Act for punishing and suppressing of Atheism and Prophaneness, and prophane Cursing and Swearing." Their Lordships, or any Seven; to meet on Thursday next, at Three of the Clock in the Afternoon, in the Prince's Lodgings. 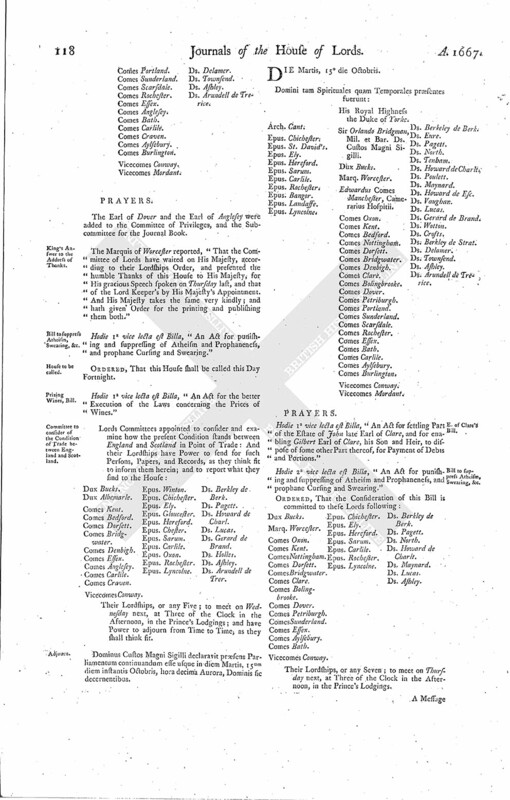 To acquaint their Lordships, that the House of Commons had agreed upon an Address of Thanks to be presented to His Majesty, for His Gracious Speech, and what the Lord Keeper spoke by His Majesty's Command; which they have thought fit to put into a Vote, to which they desire their Lordships Concurrence. "We, Your Majesty's loyal and faithful Subjects, the Commons in Parliament assembled, having taken into our serious Consideration Your Majesty's Gracious Speech, wherein You were pleased to let us know, That Your Majesty thought fit to prorogue the Parliament till the Tenth of this October, that You might give Yourself Time to do some Things which would not be unwelcome, but a Foundation for a greater Confidence for the future between Your Majesty and Your People; we find ourselves bound in Duty to return Your Majesty our humble and hearty Thanks, for the Gracious Declaration of Your Royal Intentions in that Your Majesty's Gracious Speech, and in that delivered by Your Majesty's Command by the Lord Keeper; and particularly, that Your Majesty hath been pleased to disband the late raised Forces, and to dismiss the Papists from out of Your Guards, and other Military Employments; for Your Majesty's Care in quickening the Execution of the Act for restraining the Importation of Foreign Cattle; for causing the Canary Patent to be surrendered, and vacated; and more especially, that Your Majesty hath been pleased to dismiss the late Lord Chancellor, and remove him from the Exercise of public Trust and Employment in Affairs of State. "For all which Acts of Grace and public Benefit, we Your said Commons do beseech Your Sacred Majesty to accept of these our most humble and hearty Thanks." ORDERED, That this House agrees with the House of Commons in this Vote; and that both Houses do present this Address to the King. To let them know, that this House agrees with them in the Vote of Address to His Majesty; and that their Lordships intend to wait upon the King in a whole Body, to present the same; and that their Lordships do intend to send to the King, to know what Time He will please to appoint for that Purpose; whereof their Lordships will give them Notice. Then the Lord Chamberlain was appointed to attend His Majesty presently, to know what Time He will please to appoint the Houses shall wait upon Him with this Address. 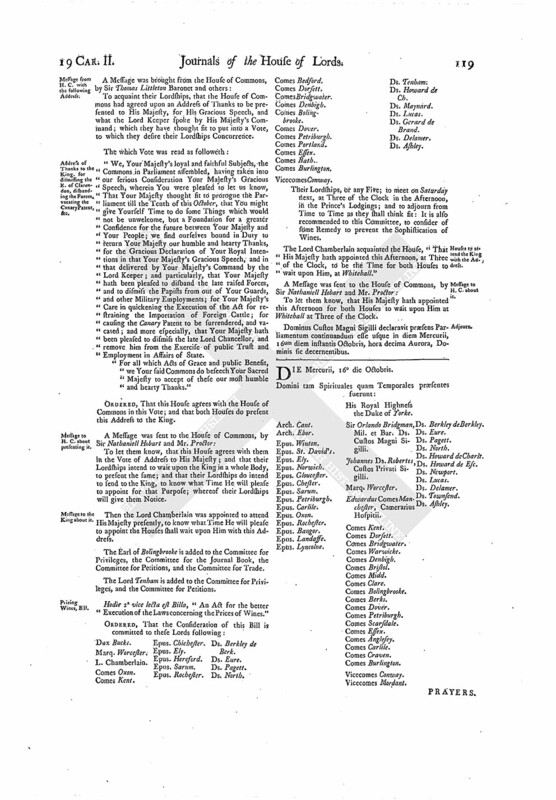 The Earl of Bolingbrooke is added to the Committee for Privileges, the Committee for the Journal Book, the Committee for Petitions, and the Committee for Trade. The Lord Tenham is added to the Committee for Privileges, and the Committee for Petitions. Hodie 2a vice lecta est Billa, "An Act for the better Execution of the Laws concerning the Prices of Wines." Their Lordships, or any Five; to meet on Saturday next, at Three of the Clock in the Afternoon, in the Prince's Lodgings; and to adjourn from Time to Time as they shall think fit: It is also recommended to this Committee, to consider of some Remedy to prevent the Sophistication of Wines. The Lord Chamberlain acquainted the House, "That His Majesty hath appointed this Afternoon, at Three of the Clock, to be the Time for both Houses to wait upon Him, at Whitehall." To let them know, that His Majesty hath appointed this Afternoon for both Houses to wait upon Him at Whitehall at Three of the Clock. Dominus Custos Magni Sigilli declaravit præsens Parliamentum continuandum esse usque in diem Mercurii, 16um diem instantis Octobris, hora decima Aurora, Dominis sic decernentibus.